Highest Quality metal construction. 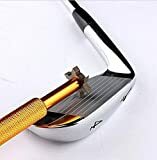 Made from high grade precision tool Vacuum Heat Treated Steel with a maximum hardness of 65 Rockwell for maximum durability and effectiveness. Groove sharpener is precision ground and engineered to exacting tolerances to ensure that it does not compromise USGA rules regarding width and depth.